When traveling it’s surprising how swiftly you can burn through that fold of cash in your pocket. A little drink here, a museum entrance fee there and a bus ride or cab fare and the next thing you know, you’re at the ATM again. One of the best ways to follow where your money disappears is to document where and how you spend your pennies. This might sounds boring, tedious and annoying, but it’s interesting to follow where your hard earned money ends up. Here are a few tips and ideas on how to track your money and how to keep a budget while traveling. For the last several years, I’ve been tracking every penny I spend on an app on my iPod. I tried the trial version, loved it, and bought the full app for $5.00. It’s been one of the best apps I’ve ever paid for. Every time I purchase something, I pull out my iPod and put it into the app. I try to do it right away because often you forget the little things, but even doing it all at once at the end of the day is good enough as you might be concerned about flashing electronics around in certain areas. The app, which is called Iexpenseit, charts, tracks and displays how much you spend each day. It gives you summaries on how much money you have left in your budget or how much per day you’ve been spending. You can search out specific purchases and track how much you’ve spent on, say, ice cream, for the last 12 months. So far there is no android equivalent of this same app, it’s only available on Apple, so other apps to consider are Mint or Expense Manager. 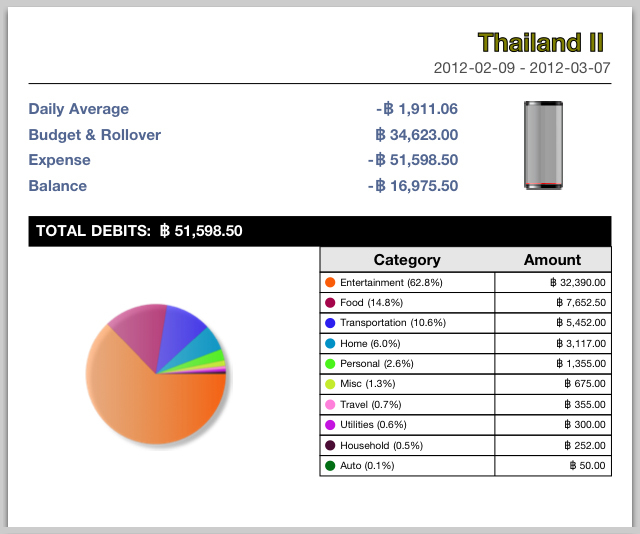 A view of a real budget of a month in Thailand. 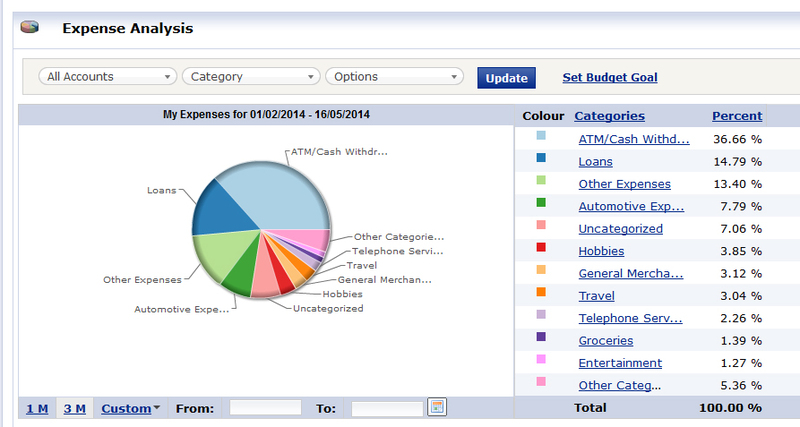 In the app you can select categories to get a more detailed look at the money spent. If you don’t want to flash your electronics around or don’t carry any with you, the next easiest option is to buy a little ledger book or notebook and hand-write everything you buy and tally it at the end of the day. This is more work and doesn’t give you averages or summaries, but can still show you where your money is being spent. Another option if you don’t have a smart phone is using an excel spreadsheet. You can find many online, such as Pear Budget, or if you have the skills, you can make one for yourself. Again, you do need access to a computer and it does become a tedious job when you have to enter a whole month’s worth of spending all at once, but it’s just as effective as an app. 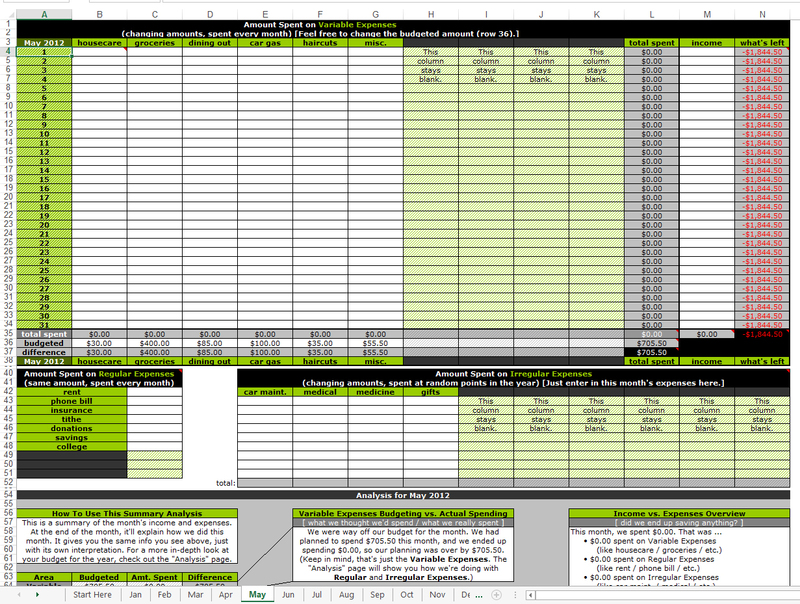 An example of Pear Budget, an excel spreadsheet you can purchase online here. My current bank offers an online budget program for free with my bank account. It tracks all the money going in and out of my account and categorizes it for me. It works very similar to what the app on my iPod does. You need a computer and internet access to use the information but it’s very useful and you see it every time you go online to check your banking. Sometimes you have to readjust the category as not everything gets tagged correctly. It also doesn’t track ATM cash withdrawls but it’s a user-friendly option. A view of part of myFinance Tracker from RBC. Ask your bank is they have something similar. These are a few ways to track your money while traveling; it’s important to choose what works best for you. With just a few swipes on my screen I can access how much money I’ve spent and how much I have left for a particular month – which helps me stay on track and not run out of money before my trip ends. It also lets you decide if you can afford that swanky hotel room for a night or two or if you better just stick to a hostel until the next month’s budget starts.